Malahide Castle boasts the title of one of Ireland’s oldest castles and spans a rich history that dates back to 1174. With so may secrets and scandals to discover, the castle is indisputably best explored with a guide. 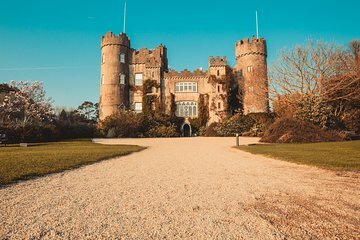 Pre-book your admission to the castle and its botanical gardens and take a guided tour of Malahide Castle’s opulent reception rooms and bedrooms, brimming with antique furniture and oil paintings. Explore the castle grounds at your own pace ad arrive at and depart from the castle at whatever time you choose. Make your own way to Malahide Castle, easily accessible from central Dublin by car or bus in 30 minutes, between the hours of 9:30am and 5:30pm. On arrival, take a guided tour of the 12th-century fortress, which has been owned by the Talbot family for more than 800 years. Delve into the opulent depths of the castle’s reception rooms and bedroom, many of which are filled with period furniture and portraits purchased form the National Gallery of Ireland. Hear tales of the Talbot family and of ghosts reputed to haunt the halls of the 800-year-old castle before heading outside to explore the castle’s sprawling grounds independently. In the botanical gardens, more than 5,000 species of plant from around the world bloom. Enrich your horticultural knowledge at interactive information panels and opt to purchase locally sourced produce from the on-site care and restaurant. Between two and four hours is a sufficient time to spend inside and around the castle. Beautifull castle. Worth a visit. Allott more time to spend on the grounds if it is a sunny day!